I have heard so much about Jillian Michael’s 30 Day Shred that I decided to try it for myself. I bought the DVD, a yoga mat and some weights. I made a 30 Day Shred Calendar to keep track of the times that I completed the program. I wanted to share it with anyone who is also starting this program. I might make some changes once I complete the program if I realize that something needs to be adapted but this is the 30 day calendar that I plan to use. How do you use the printable countdown? Firstly, fill in the days of the week in the orange rectangles at the top of the page. If you are starting on a Monday then write Monday on top of Day 1 and complete the rest of the week. Fill out your measurements on day 1 so that you can compare them to your measurements at the end of the program. Each day, after you complete the workout, mark off that day! What is the 30 Day Shred? This is a 30 day fitness program which includes 20 minutes of intense exercise every day for 30 days. It was developed by Jillian Michaels who trained the contestants in The Biggest Loser TV show. Jillian helped the contestant achieve impressive results. I have heard from tens of people who have lost both weight and inches during this program. It isn’t easy but it works. You can buy the DVD online or watch it on You Tube. Weights or water bottles filled with water if you don’t want to purchase weights. How much do you lose? People see substantial results after 30 days. I have seen my friends before and after photos and they are impressive. 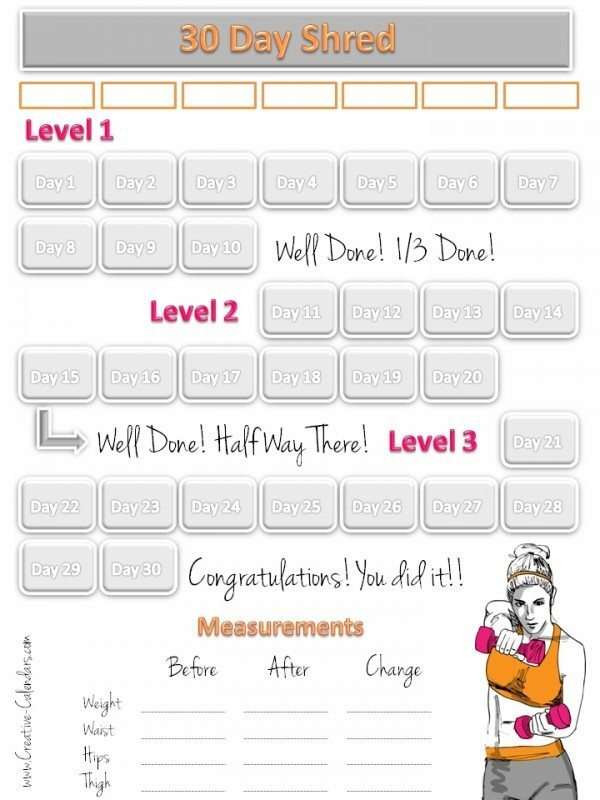 The printable 30 day countdown that I have shared with you includes a table with before and after measurements to help you track your results. As with any other fitness program it is recommended to check with your doctor before you start.